Location/ Directions: Third Avenue to E Street go North on E Street to West Ship Creek Avenue, turn right. Hotel on left side of street. Railroad View: Excellent. Any room on the second or third floor on the front side of the motel will have an excellent view. A parking lot could obstruct views from the 1st floor. 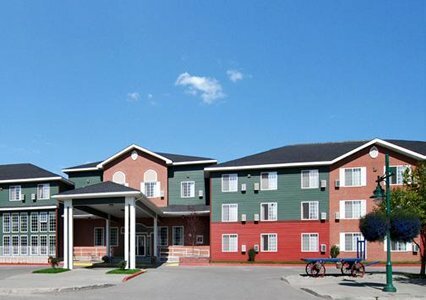 Motel is within walking distance to ARR's Anchorage train station. 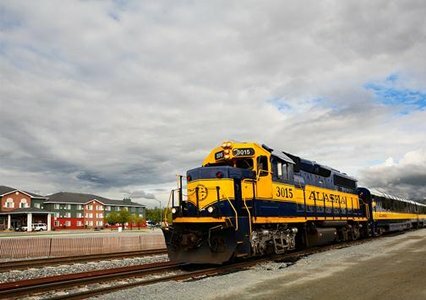 Photo Comment: A westbound Alaska Railroad train is passing the Comfort Inn motel. Other than a parking lot, there are no obstructions to block the railroad view from the front of the motel. The train station is a couple of blocks behind the photographer. Photo courtesy of the motel web site.